While perusing a local grocery store earlier this week, I was shocked to see boxes and boxes of fall seasonal beers already being displayed. Now, this shouldn’t have surprised me too much because so many stores start putting out Christmas decorations in October, but it doesn’t hardly feel like autumn yet. Hell, there are still plenty of summer beers I didn’t get the chance to try! I’m not complaining too much because there are always some great seasonals during this time period. The transition is a bit jarring after all this 90 degree weather, but it’s a welcome change. 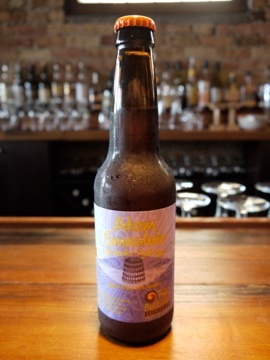 One particular beer caught my eye — a new offering from a local favorite: Atom Smasher by Two Brothers Brewing Company. Labeled as an Oktoberfest style lager, this brew was aged in French oak foudres, a fancy term for large casks. It doesn’t take much for me to get excited about a beer — if it says “barrels”, “bourbon”, or “aged in”, I’m sold. This local seasonal did not disappoint at all. In a glass, the Atom Smasher has a golden amber appearance with very little lacing. The initial taste is a bit sweet but busts out some spices — namely, nutmeg and cinnamon — and throws in an aftertaste that reminds me a lot of a caramel apple. The oak aging gives it a unique complexion that makes it stand out from other Marzen-style lagers. Atom Smasher weighs in at a potent 7.7% ABV, but it goes down pretty smooth. Normally I don’t go out of my way to pick up Oktoberfest brews, but I’m glad I gave this a shot. Two Brothers generally churns out consistently quality beers, and this one isn’t an exception. Highly recommended if you’re in the Chicagoland area. No problem! Yeah, it’s crazy how many different styles of craft beers there are today. It’s almost overwhelming, but Two Brothers always brews top quality beers. You can’t go wrong with anything from them, really. Thanks for the beer review. I’m always looking for something new. And eventually I will use the beer making kit I got last Christmas. Anytime, Victor! I have tried homebrewing a few times myself, but have had little success. My best effort was a pumpkin beer, but I went overboard with the spices, I think, and it had a horrid aftertaste. Ah well, the only way to get better is to keep doing it! Good luck with your brewing! Haven’t encountered the Atom Smasher yet but I will be sure to give it a try if I do! Two Brothers seems to be expanding quite a bit lately, so there is a chance they could reach Minnesota soon (if they haven’t already). Definitely recommend keeping an eye out for their beers!